Vert- Field of View causes cropping of top and bottom of screen. No currently announced plans to fix this. As with multi-monitor, there is no official support; however, this may still be tolerable depending on your aspect ratio. 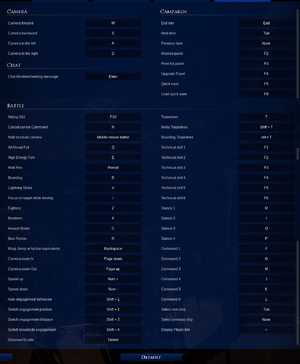 FXAA and two settings for TAA. Image Sharpening is also an option. Find FrameRateLimit and change the number value as desired. A value of '0' for this setting will result in a 62 FPS cap. 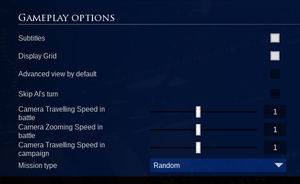 Camera scrolling and zooming sensitivity options available. The majority of gameplay uses an unlocked mouse cursor. Affects camera movement when rotating the view. See Mouse sensitivity notes. General, Music, SFX, and Voices. Co-op Campaign and Battle (Skirmish). Co-op supports up to two players. Skirmishes are 1v1 or 2v2 with a Ranked option. Can be caused by using keyboard commands (e.g. Alt+Tab ↹) to switch between windows. Press Alt+Tab ↹ to focus away from the window. Manually click on the icon for Battlefleet Gothic: Armada II from your Taskbar. Alternatively, a game restart will work. The patch released on April 1, 2019 has addressed this issue. 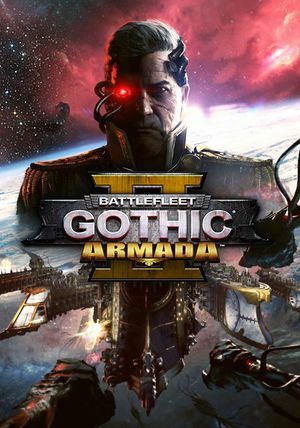 Right-click Battlefleet Gothic: Armada II from your Steam Library and select "Properties." In the window that opens, enter -WinX=0 -WinY=0 on the line provided. Press "OK" to save changes and close the Properties window. Battlefleet Gothic: Armada 2 uses Vert- Field of View scaling, causing displays wider than 16:9 to zoom in more than intended. ↑ 1.0 1.1 File/folder structure within this directory reflects the path(s) listed for Windows and/or Steam game data (use Wine regedit to access Windows registry paths). Games with Steam Cloud support may store data in ~/.steam/steam/userdata/<user-id>/573100/ in addition to or instead of this directory. The app ID (573100) may differ in some cases. Treat backslashes as forward slashes. See the glossary page for details. This page was last edited on 3 April 2019, at 04:43.